Every summer since 2008, we have been sending 5 to 12 CSU students to work at CERN on ATLAS research projects. These students came from NUPAC campuses: Channel Islands, Fresno, Humboldt, Long Beach, Los Angeles, Northridge, Pomona, Sacramento, San Francisco, and Sonoma. These students have received funding support from College of Science and Mathematics (CSM) of Fresno State, Instructionally Related Activities (IRA) from Associated Students Inc. (ASI) of Fresno State, Faculty Sponsored Student Research (FSSR) of Fresno State, NSF's Office of International Science and Engineering (OISE), Hu Institute Summer Research Grant of CSU Sacramento, and NSF's International Research Experience for Students (IRES) (Award number: 1854214, from 3/15/2019 to 2/28/2022; and Award number: 1459240, from 8/1/2015 to 7/31/2018), etc. The students worked at CERN with ATLAS physicists from CERN, University of Chicago, Lawrence Berkeley National Lab (LBNL), Stanford University, Stanford Linear Accelerator Center (SLAC), UC-Irvine, University of Washington, etc. on various ATLAS projects. Some of these projects are briefly described below. Besides working on ATLAS research projects at CERN, the students also attended the famous CERN Summer Student Lecture Series given by top physicists from all over the world. Ben Zastovnik, a physics major from Fresno State, worked at CERN during summer of 2008 on improving VP1 with ATLAS physicists Thomas Kittelmann (from University of Pittsburgh) and Edward Moyse (also from University of Pittsburg). Zastovnik was supported by College of Science and Mathematics (CSM), Instructionally Related Activities (IRA) from Associated Studetns Inc. (ASI), and Faculty Sponsored Student Research (FSSR) of Fresno State. VP1 is a 3D event display tool for ATLAS experiment. The Qt/OpenGL based application provides truthful and interactive 3D representations of both event and non-event data and serves a general-purpose role for ATLAS. Zastovnik's summer project was to improve VP1 with new features which include adding Monte Carlo truth vertices to VP1, new geometry and realistic colors for the Pixel detector in VP1. After 7 weeks of hard work by Zastovnik, all these new features were successfully introduced to VP1 and released to ATLAS collaboration by the end of his CERN trip. Zastovnik presented his research work on VP1 at a physics colloquium of Fresno State in Fall 2008. Fresno Bee the central valley newspaper, also interviewed him and reported his CERN experience in August 2008. Zastovnik graduated from CSU Fresno in 2009. His VP1 experience at CERN helped him land a software engineer position to work on flight simulators at Edwards Air Force Base in Lancaster, California. Lawrence Carlson, a physics major at CSU Fresno, worked at CERN during summer of 2008 on IDEMS interface with the ATLAS Inner Detector Services (IDS) team (Dr. Steve McMahon, Dr. Saverio D'Auria, Dr. Urban Bitenc, Dr. Illona Kostyukhina, Dr. Luca Luisa, and Dr. Charlie Young). Carlson was supported by College of Science and Mathematics (CSM), Instructionally Related Activities (IRA) from Associated Studetns Inc. (ASI), and Faculty Sponsored Student Research (FSSR) of Fresno State. 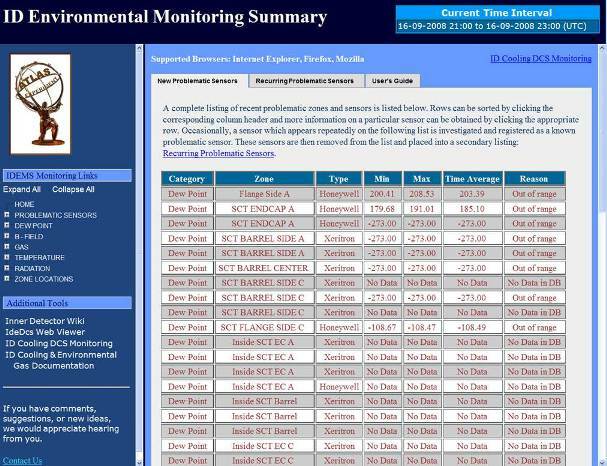 Carlson's project is to provide near real-time data analysis and weekly summaries on environmental variables using web-based tools and display these results graphically in the control room. The environmental variables include radiation level, magnetic field, temperature, gas, dew point measurements from over 1200 sensors. Carlson presented his work at Pixel working group meetings and continued working on this project after returning from CERN. He completed the project, with more than 50,000 lines of code, and released it to the ATLAS Inner Detector community by the end of 2008. His tools have been parts of the IDEMS in ATLAS Control Room during the ongoing ATLAS data taking. Carlson also worked at CERN and Stanford Linear Accelerator Center (SLAC) during summers of 2009, 2010, and 2011. James MacDougall, a physics major from CSU Sacramento, worked at CERN during summer of 2009 on SCT fatal charge dosage study with ATLAS physicists Dr. Steve McMahon from Rutherford Appleton Laboratory (RAL) in UK and Dr. Charlie Young from Stanford Linear Accelerator Center (SLAC). MacDougall was supported by Hu Institute Summer Research Grant of CSU Sacramento. SCT, being closest to the interaction region where small Big-Bangs are created, is potentially subject to various beam loss scenarios. A clear understanding of the susceptibility of the SCT components to damages from beam loss is essential for the safe operation of the detector system. In beam loss scenarios the weak link within the modules appears to be the ABCD asic. This application specific integrated circuit is warranted by the manufacturers to withstand a 5nC charge application within 25ns, which is the period of the LHC bunch crossing. 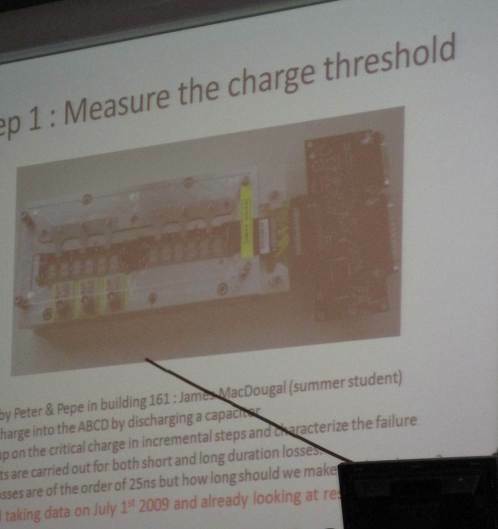 MacDougall built up test stand to validate the 5nC threshold, investigated the chip vs. charge performance in the region above 5nC, and derived charge dosage parameters for use in subsequent laser and testbeam exposures. In repetitive tests, both single-channel and multi-channel charge injections, the 5nC/25ns/chip safety threshold was validated. Single channel were found to withstand in excess of 65,000 repetitive charge pulses, over periods of several milliseconds, at various pulse time constants. It was confirmed that the ABCD chip does possess some significant additional protection above 5nC. 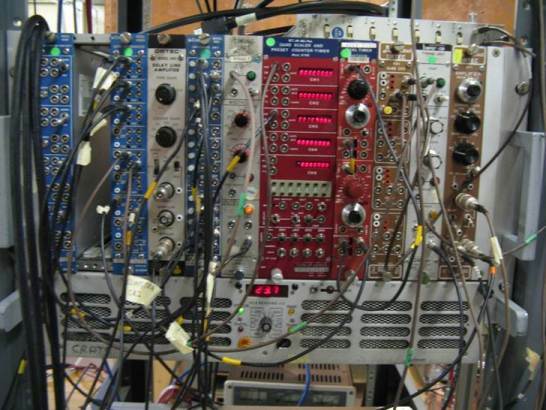 The single channel electronic components and/or bonding connections were determined to be the experimental weak link and acting as protection links for the ABCD chip. Preliminary microscopic investigation yielded no indication of physical failure point. The results were presented twice to interested parties of the inner detector community at CERN. MacDougall also presented this work to faculty and students at physics colloquia on both the CSU Sacramento and CSU Fresno campuses. A project paper was also prepared which describes in detail the background, execution and results of the experiment. The paper was circulated to interested parties of the ATLAS inner detector community. James MacDougall, a physics graduate student at Fresno State, worked at CERN during summer of 2012. 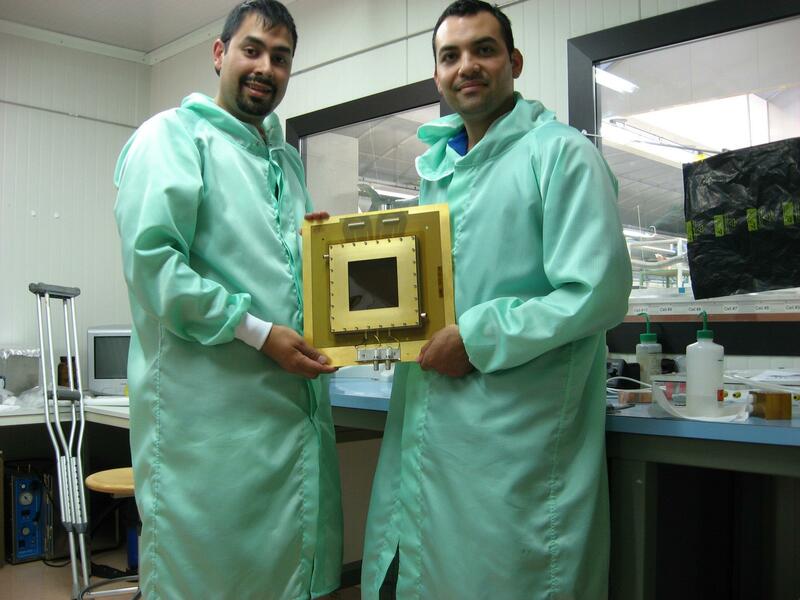 He investigated the data output of the FSI subsystem of the ATLAS Inner Detector. MacDougall was supported by College of Science and Mathematics (CSM) and Instructionally Related Activities (IRA) from Associated Studetns Inc. (ASI) of Fresno State. FSI monitors the physical shape of the detector in real time and is intended to improve the accuracy of subatomic particle tracking. The system had never fulfilled its expectations and was on the verge of being terminated due to its high cost of operation and lack of contribution. However, following initial orientation to FSI and the opportunity to observe the details of the system, James was able to identify and demonstrate a hardware issue which is at the root of the system's dysfunction. Under the supervision of a FSI colleague, Dr. Zhijun Liang, James executed an innovative temporary correction which validated the observed dysfunction. This result was presented at the following FSI group meeting where further study of the problem was suggested. A critical element of the FSI system is the coupling of free space lasers into single mode optical fibers. Subsequently, James devised and presented a proposal for an FSI Laser Coupling Upgrade which generated significant improvements in the performance of the system. Because of the visible and significant contribution to FSI by James MacDougall, ATLAS FSI group invited James to return to CERN to work on FSI for another 3 months. ATLAS experiment paid his airfare, hotel, and salary for James to return to CERN from September to December of 2012. Sarah McGovern, a physics and communication double major at CSU Long Beach, worked at CERN during the summer of 2010 on ATLAS e-News with the ATLAS e-News team (Dr. Pauline Gagnon from Indiana University, Ceri Anna Perkins from CERN, and Katie McAlpine from CERN). During her stay at CERN, McGovern interviewed ATLAS physicists and students and wrote stories about them and ATLAS events. She has published 5 pieces of her work in ATLAS e-News: "ATLAS at ICHEP", "South Africa Joins ATLAS", "Profile of Pascal Pralavorio", "2010 ATLAS Summer Students Succeed! ", "ATLAS Helps Plant Learning Tree in South Africa". Program officers at NSF's Office of International Science and Engineering (OISE) were impressed by McGovern's work and contacted Prof. Yongsheng Gao to offer support for McGovern's CERN trip. McGovern received $7650 (stipend of $3600, travel of $1350, and subsistence of $2700) from NSF's OISE in Nov. of 2010 for her work at CERN. Brent Wilson, a physics graduate student at Fresno State, worked at CERN on W and Z Bosons physics analyses with first ATLAS data during summer of 2010. Wilson was supported by College of Science and Mathematics (CSM) and Instructionally Related Activities (IRA) from Associated Studetns Inc. (ASI) of Fresno State. W and Z bosons are carriers of the weak force and their discoveries by UA1 and UA2 experiments at CERN in 1983 received the Nobel Prize in Physics in 1984. The rediscovery of W and Z bosons from first ATLAS data is essential for calibration of the ATLAS detector, performance, and software system. Wilson worked with Dr. Harinder Bawa from Fresno State on this subject during his stay at CERN during the summer of 2010. He gave a physics colloquium at Fresno State in October 2010 and a presentation at the Central California Research Symposium in April of 2011 which he received the Best Graduate Student Presentation Award. Wilson was selected into the CSU Fresno delegation to compete in the 25th Annual California State University Student Research Competition in May 2011. Alexandra Moskaleva, a physics major at CSU Sacramento, worked at CERN during summer of 2010 on a project lead by Dr. Joerg Wotschack from CERN to develop and test the MicroMegas particle detector. 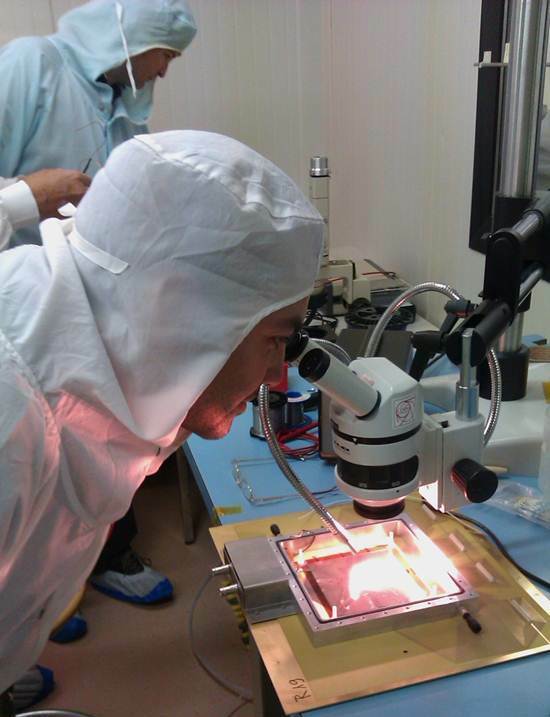 Moskaleva was supported by Hu Institute Summer Research Grant of CSU Sacramento. MicroMegas is a gaseous micropattern muon detector and is a candidate for the ATLAS muon system upgrade. While MicroMegas detectors themselves are quite new, the CERN team developed a new design component for the detector by placing an insulative layer with resistive strips directly above the readout strips. Gain measurements on R11 (under gas mixture of 93:7 Ar:CO2), R12 (under gas mixture of 93:7 and 85:15 Ar:CO2), and R13 (under gas mixture of 93:7 and 85:15 Ar:CO2). A radioactive 55Fe and a high-intensity Cu source were used for these measurements to measure a gain over a wide spectrum of applied voltages and particle rates. Transparency measurements on Gain measurements on R11 (under gas mixture of 93:7 Ar:CO2), R12 (under gas mixture of 93:7 and 85:15 Ar:CO2), and R13 (under gas mixture of 93:7 and 85:15 Ar:CO2). A radioactive 55Fe source was utilized. Cosmics measurements with R11, R12, and R13. A trigger and acquisition system was setup such that R11 and R13 were placed on either side of R12. R11 and R13 were used to trigger on a cosmic particle, and a readout was taken from R12. A charge up effect was also noticed in the laboratory and investigated. The effect was measured in R11 (under gas mixture of 93:7 Ar:CO2), R12 (under gas mixture of 93:7 and 85:15 Ar:CO2), and R13 (under gas mixture of 93:7 and 85:15 Ar:CO2). Again, a radioactive 55Fe and a high-intensity Cu source were used for these measurements to measure a gain over a wide spectrum of applied voltages and particle rates. Alexandra Moskaleva also participated in a test beam in July 2010, and contributed by covering eight eight-hour shifts, totaling 64 hours. During her stay at CERN, she also helped to set up experiments and take and record measurements, while monitoring data quality. Moskaleva gave several talks, poster presentation and colloquium at CSU Sacramento on her CERN work. She also gave a poser presentation at American Physical Society (APS) meeting in April of 2010 titled "Investigating a Candidate for ATLAS Muon System Upgrade". 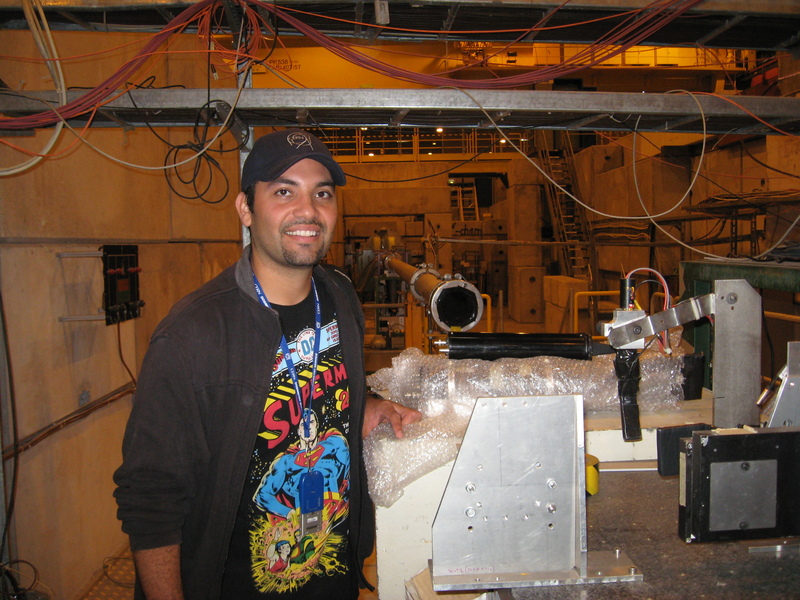 Navid Rad, a physics graduate student at Fresno State, worked at CERN on NLOjet++ and APPLGrid in the ATLAS Jet Cross Section group with Dr. Tancredi Carli and Dr. Pavel Starovoitov during summer of 2011. Rad was supported by College of Science and Mathematics (CSM) and Instructionally Related Activities (IRA) from Associated Studetns Inc. (ASI) of Fresno State. Before Rad started working on this project, there were significant discrepancies between NLOjet++ and Pythia calculation of the jet cross sections. After looking into NLOjet++ and APPLGrid source code and comparing with Pythia manual carefully, Rad found out the main causes of the significant discrepancies. He presented his finding and results twice at the ATLAS Jet Cross Section working group meetings at CERN. 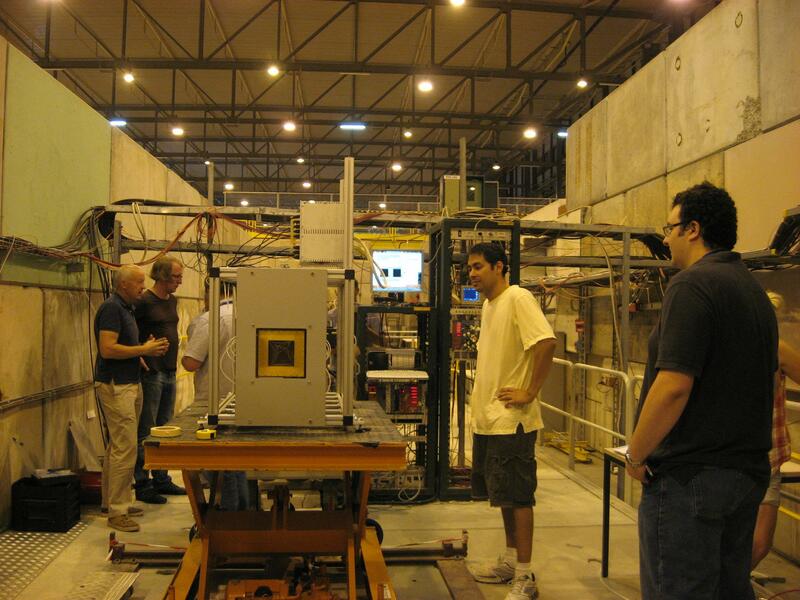 After returning from CERN in fall 2011, Rad has been continuing his work with ATLAS Jet Cross Section working group. He returned to work at DESY (The Deutsches Elektronen-Synchrotron) in Germany during summer of 2012 on NLOjet++ and APPLGrid which will significantly reduce the Monte Carlo simulation time comparing with old simulation packages like Pythia. This will be very useful for many future physics analyses on ATLAS. Navid gave poster presentation at the Central California Research Symposium in April 2012 and won the "Best Graduate Student Poster Presentation Award". He gave one presentation to ATLAS Jet Cross-Section Working Group during summer of 2012. Emmanuel Angulo and Lawrence Carlson, physics graduate and undergraduate students at Fresno State, worked at CERN during summer of 2011 on micromegas R&D projects for ATLAS muon detector upgrade led by Dr. Joerg Wotschack of CERN. Angulo and Carlson were supported by College of Science and Mathematics (CSM) and Instructionally Related Activities (IRA) from Associated Studetns Inc. (ASI) of Fresno State. They developed and tested the micromegas detector and presented their results twice at the Micromegas R&D working group meetings at CERN. 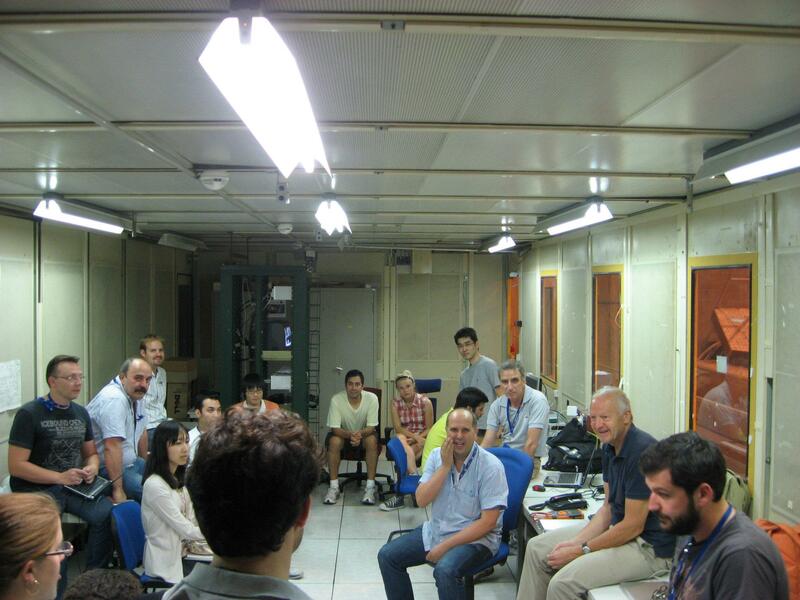 They also participated in test beam activities at CERN in July 2011. Emmnauel was invited to give the Conclusion Panel Presentation at the Central California Research Symposium in April of 2012. This is a great honor for him, our ATLAS program, and physics department. 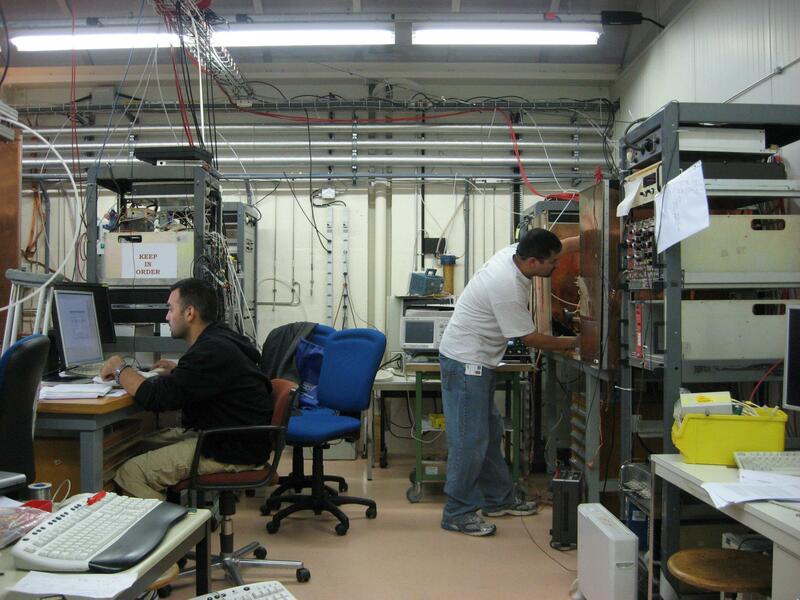 Emmanuel Angulo and undergraduate student Simon Gonzalez worked at CERN again during summer of 2012. Angulo and Gonzalez were supported by College of Science and Mathematics (CSM) and Instructionally Related Activities (IRA) from Associated Studetns Inc. (ASI) of Fresno State. They continued working on micromegas R&D projects for ATLAS muon detector upgrade and have given 5 talks at ATLAS muon R&D working group meetings during summer of 2012. Their work includes performing different lab experiments at CERN, functional uniformity results of a new T-series chamber design, etc. 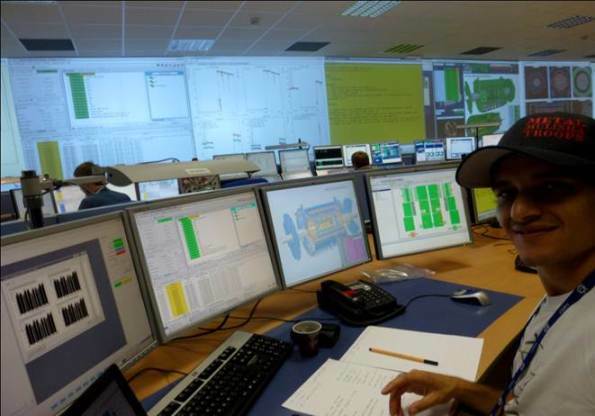 Simon Gonzalez from Fresno State and Brandon Ausmus from CSU Channel Islands worked at CERN during summer of 2013. Gonzalez was supported by College of Science and Mathematics (CSM) and Instructionally Related Activities (IRA) from Associated Studetns Inc. (ASI) of Fresno State and Ausmus was supported by CSU Channel Islands. They worked on micromegas R&D projects for ATLAS muon detector upgrade and performed various mechanical measurements and tests of micromegas L2 panel. They have given 2 talks at ATLAS muon R&D working group meetings during summer of 2013 about their findings. Arya Afshari, a physics graduate student at Fresno State, worked at CERN during summer 2011 and 2012 with Dr. Harinder Bawa of Fresno State. Afshari was supported by College of Science and Mathematics (CSM) and Instructionally Related Activities (IRA) from Associated Studetns Inc. (ASI) of Fresno State. He wrote ROOT code for the analysis of Monte Carlo (MC) simulation for excited W* boson. The Large Hadron Collider (LHC) beam energy upgrade from 7TeV to 8TeV required new Monte Carlo simulation of ATLAS data. The MC's were previously generated by the Pythia6 software. Afshari compared the previous event generator Pythia6 with the new event generator Pythia8, which incorporated new physics parameters, and he compared new parton distribution functions (PDF's) CTEQ, MRST, and MSTW. In the search for the W*, specific dijet parameters were investigated and compared to quantum chromodynamic (QCD) backgrounds. This research has been ongoing from summer 2011 to present times. Afshari has presented his work at the 2011 Annual Meeting of the California Section of the American Physical Society, physics colloquium at Fresno State in October 2011, at the Central California Research Symposium in April 2012, and the CSM Open House at Fresno State in May 2012. Gradon Faulkner is a physics major from CSU Channel Islands. 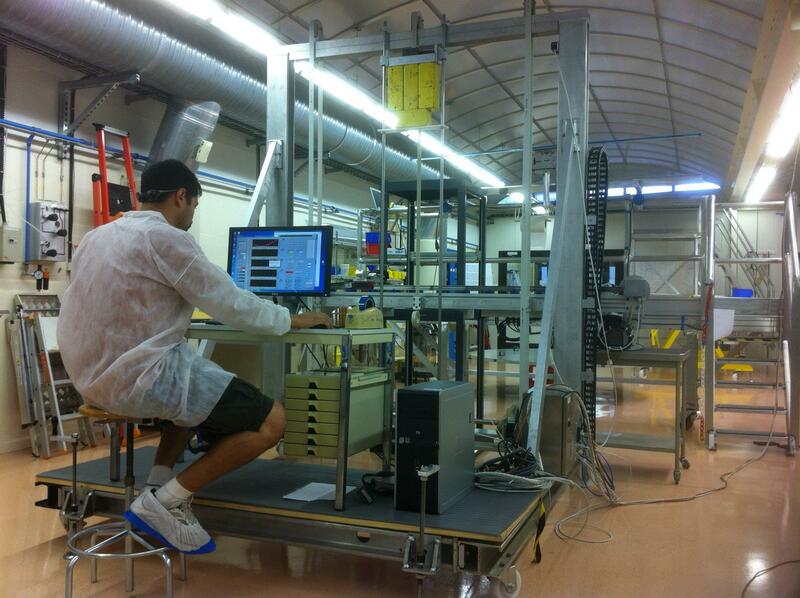 He worked with ATLAS physicists Dr. Alberto Annovi from INFN Laboratori Nazionali di Frascati and Dr. Wainer Vandelli from CERN of the ATLAS Trigger and Data Acquisition (DAQ) team during summer of 2013. Faulkner was supported by CSU Channel Islands. Trigger/DAQ is key for ATLAS data collection. The ATLAS experiment is developing a FastTrack trigger for real-time reconstruction of charged trajectories in the full Inner Detector. The FastTracker uses Associative Memories to associate hit positions into tracks by comparing all detected hits with a set of pre-calculated trajectories called patterns. In order to cover all possible trajectories of interest with the desired resolution 1 billion patterns are needed, corresponding to an Associative Memory device with 1 billion locations. 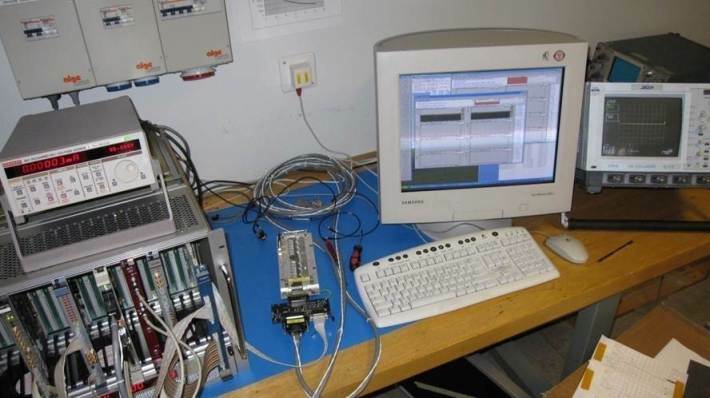 Faulkner studied a new way to prepare patters and did an excellent job in developing a preliminary optimization algorithm for the ATLAS hardware tracker (FTK). The algorithm searches for track pattern grouping schemes that allow a reduction of the pattern data without affecting the physics performance. It will result in a higher overall efficiency of the FastTracker system. Faulkner gave two presentations at ATLAS Trigger/DAQ working group meetings at CERN. Varun Varahamurthy is an undergraduate student at Fresno State. 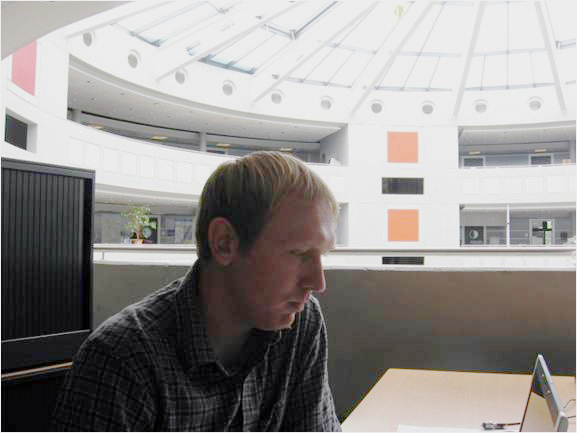 He worked at CERN on new ATLAS Inner Tracker visualizer and simulator packages with Dr. Steve McMahon during summer of 2011. Dr. McMahon is projector manager of ATLAS inner detector. Varahamurthy was supported by College of Science and Mathematics (CSM) and Instructionally Related Activities (IRA) from Associated Studetns Inc. (ASI) of Fresno State. Varahamurthy developed software packages to give 3D visual representation of Semi Conductor Tracker (SCT) modules in specified configurations, study and simulate behavior due to various parameters and events, and provide a modular and reusable library for similar tracking and geometric analysis. Varahamurthy made excellent progress in visualization, construction and simulation in these packages. Geometry package was used extensively for visualization which was implemented in C++ using ROOT. Varahamurthy encoded positional and rotational data into transformation matrices with ROOT geometry package. He implemented custom TrackerModule, TrackerRing and TrackerLayer classes in construction. He also implemented custom track class as basic charged particle track descriptor in simulation and hit detection is handled by each module independently. Varahamurthy's work was presented to ATLAS Inner Detector working group meeting. Michael Hatfield is an undergraduate student from CSU Pomona. He worked at CERN during summer of 2011 with Dr. Harinder Bawa of Fresno State on simulation using ATHENA framework with ATLAS Tier 3 facility of Fresno State. Hatfield generated new physics Monte Carlo samples through full detector simulation, digitization and reconstruction using ATHENA frame work on Fresno State Tier 3 facility which consists of 136 cores and 108 raw storage space. He also developed full chain script which can be run with one Condor submission. The document Hartfield wrote about the simulation can be found here . Olivia Krohn, a physics undergraduate student at Fresno State, worked at CERN during summer 2016 with Dr. Aaron Armbruster and Dr. Lauren Tompkins of Stanford University. Krohn was supported by College of Science and Mathematics (CSM) and Instructionally Related Activities (IRA) from Associated Studetns Inc. (ASI) of Fresno State, and NSF IRES award. Olivia performed modeling of Higgs coupling analysis for the ATLAS/CMS Higgs Working Group and developed statistical analysis package. Olivia presented her results at ATLAS Working Group meeting and American Physical Society national conference in 2017, as well as physics colloquiumat Fresno State in October 2016. Olivia graduated in 2017 and was admitted to Ph.D programs at University of Colorado (Boulder), University of Maryland (College Park), University of Michigan, and University of Washington. She entered Ph.D program at University of Colorado in fall of 2017.